"Because life is a team sport ..."
PLT is a comprehensive leadership development program with a free, open-source ​Social-Emotional Learning (SEL) curriculum for K-12 schools. More than a curriculum . . .
PLT is a "Personalized Leadership Training" program designed to explicitly teach students key Social Emotional Learning (SEL) habits to prepare them for academic, professional, and personal success. 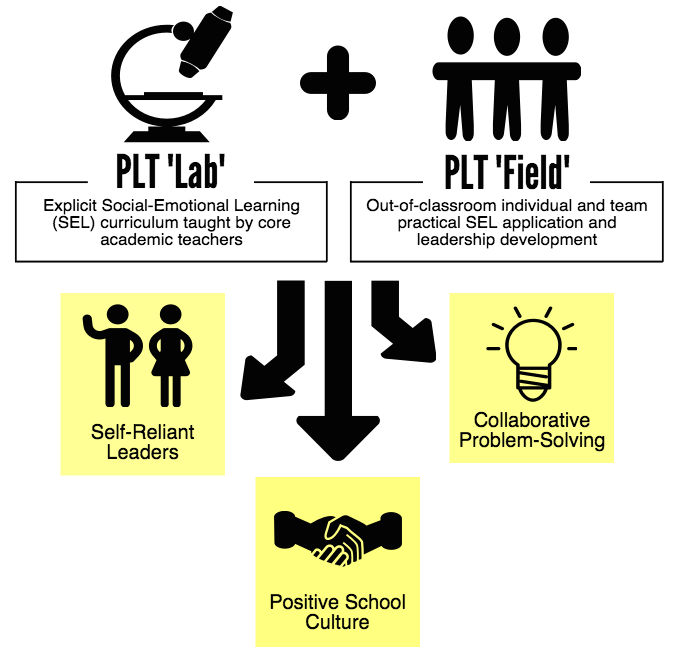 PLT combines blended curriculum, in-class group discussions, peer support and assessment (PLT "Lab"), and personalized outdoor training and leadership structures to provide experiential opportunities for students to practice and apply these SEL habits to real-life situations (PLT "Field"). This year, we are proud to be piloting our PLT Field "Starter Kit" with Austin Achieve Public Schools and Valor Collegiate Academies. One hundred and fifty students from Blanca Alvarado Middle School in East San José, CA, pour out of the school building and onto the blacktop. Clustering into ad hoc groups of three to six, everyone begins a light warm-up. Some do jumping jacks while others stretch. Meanwhile, trainers in bright yellow pinnies organize their materials: stopwatches, clipboards, data-tracking binders, and observation sheets for recording individual fitness milestones. Based on the first few minutes, it already looks as if this class has incorporated some elements of next gen learning. Competency-based fitness progressions, data collection on individual performance, and student choice are clearly part of this program. Promising practices, to be sure, but take a closer look: the trainers, now leading the class through a more structured round of warm-ups, are middle school students themselves . . .
Read tweets above about our first SEL and Positive Discipline Practitioners Convening. He disrespected teachers and classmates and disliked school. Barely 1½ years later, the new Drew trains younger schoolmates in fitness exercises, turns in assignments on time and speaks articulately about classes at Alpha: Blanca Alvarado Middle School, and his future. He credits his turnaround to his school’s innovative mashup of calisthenics, boxing, counseling and leadership development. Three years in the making, Alpha’s Personal Leadership Training equips students with physical self-defense skills and emotional ones as well, and helps them navigate the shoals of teenhood, tough academic demands, the storms of their rough neighborhood and social media . . . When I was a classroom teacher, the best “tech” I had access to was a shared VCR/DVD player and a cracked overhead projector. As a result, I was unable to leverage technology for better “personalization” in my classroom, and so I leveraged relationships, instead. I “personalized” by getting to know my students deeply--beyond just their academic strengths and weaknesses. By knowing what was going on at home, their emotional triggers and what motivated them, I was able to make sure their needs were met beyond my classroom - which led to much greater academic success within it.